When we get together as a company, we’ve been known to not only have a good time, but to also capture and share it in a creative way. What’s better than combining adventure and photography? That's why we were thrilled to work with GoPole, a company that creates products for that exact exciting combination. 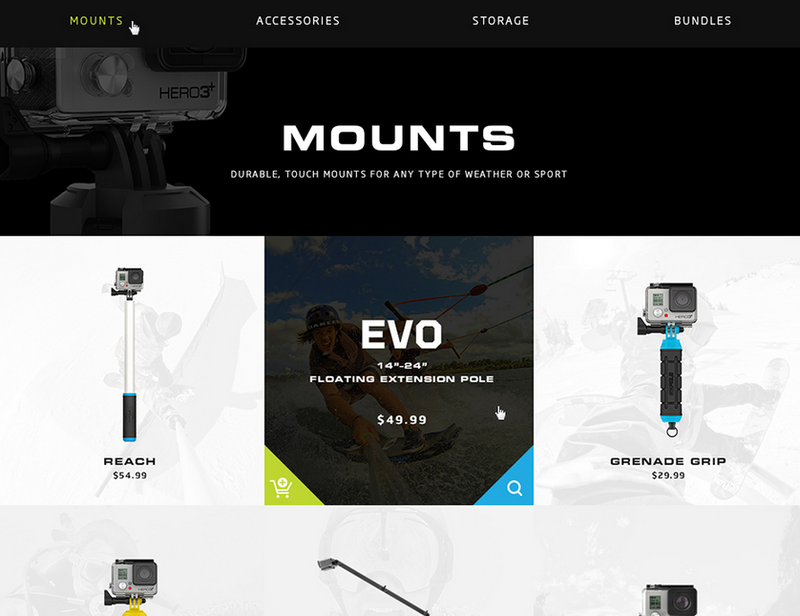 GoPole, the number one selling brand for GoPro camera accessories and mounts, was looking for a new site that reflected their international success and growing brand presence. 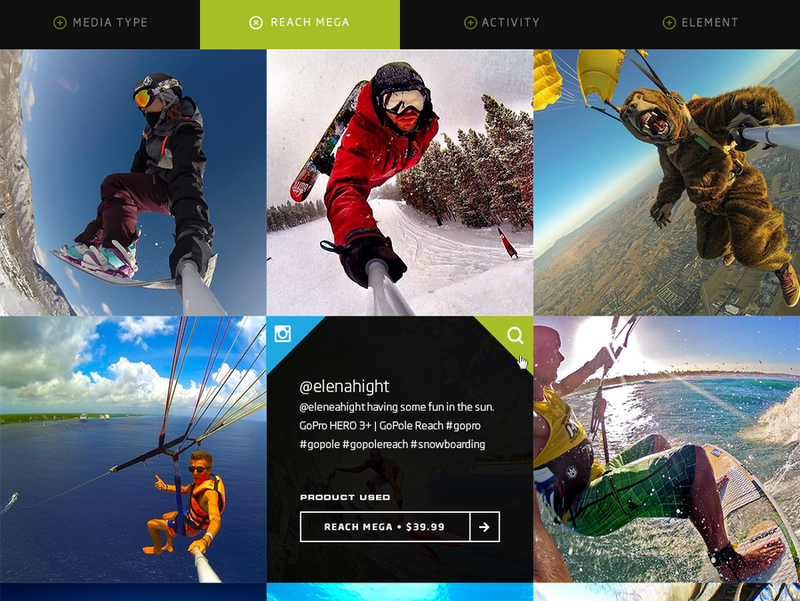 But most importantly, they needed a site that matched the active lifestyle of their audience. With that in mind, we set out launch the new GoPole.com. GoPole sells their products internationally through several channels -- big retail chains, small sports shops, and in their own online store. While creating an intuitive and functional e-commerce system for users to easily purchase products was a priority, we knew the site was more than just an online store. The story of GoPole and its brand is best told through its users. Cliff jumping, parasailing, canyon diving, surfing, bungee jumping, skydiving -- if you can imagine it, a GoPole owner has probably done it (and proudly shared their photos as evidence). We were inspired by the vibrancy we found in these photos, and knew they had to play a significant role on the new site. What tells the GoPole story better than the look of a skydiver freefalling in a bear suit, or a surfer catching the perfect wave right as the sun sets? We made it a priority to use these photos across the site. Media is featured on the homepage, in a dedicated media section (where you can filter by photo, video, element, activity, and product used), and of course, on the product pages. These photos effectively sell the utility and the story behind the product. The biggest challenge we faced centered around the most important part of the site: the product pages. With a product set of 10-15, we knew we needed a templated approach so products could be created, updated, and maintained over time from the Shopify admin interface. But we also wanted to achieve rich product animations to demonstrate a variety of product features, and to give each page a custom-feel. We started by doing an inventory of all the features that needed to be animated or demonstrated in some way. With close collaboration across UX, design, and front-end development, we were able to identify five different patterns that would cover every animation. The result? A set of five animated modules, some affectionately given titles like 'the scrubber' and 'the sandwich', that could be applied to any product. With this system, we could achieve anything from the Bobber splashing into water to the Scenelapse rotating 360 degrees. High on the list was making sure GoPole had a reliable e-commerce experience that matched their operational needs. For this, we turned to Shopify, leveraging their platform for all product-related pages and for the checkout process. We were able to leave some of the heavy-lifting behind processing user payment and fulfillment data to the Shopify platform, while we focused more on product animations and media. While everything on the product-side lives on the Shopify platform, we needed a robust and flexible CMS to manage the rest of the site. This included content like a blog, the media section, distributor data, a store locator, and multiple customer inquiry forms. These areas required a significant amount of control and flexibility for GoPole content managers, so we needed an easy system to house this content. With Craft, we were able to deliver just that -- a powerful but easy-to-use CMS that GoPole could easily access. We leveraged the strengths of both Shopify and Craft, and came out with the best of both worlds. 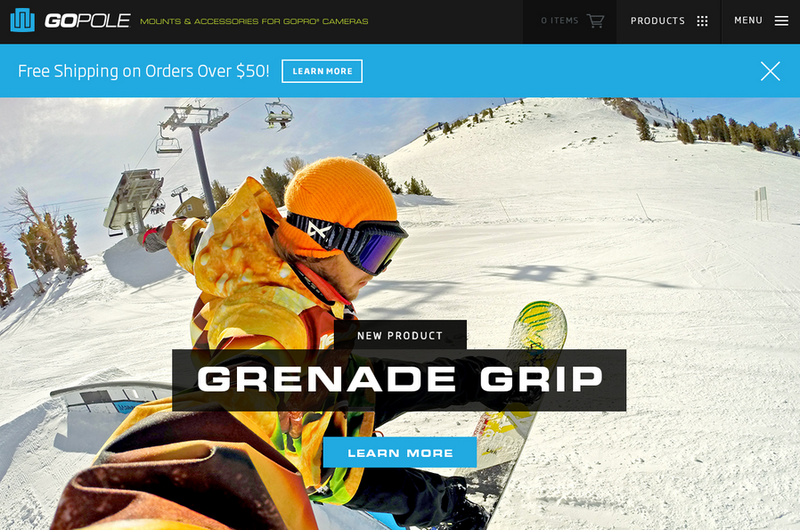 We enjoyed partnering with GoPole to build a flexible e-commerce site that matches their adventurous, fun-loving consumers. For more details on the work, check out our full case study. And visit gopole.com to see the work, and GoPole's daring users, in action.